After the blustery morning packing up from Wilpena Pound we got to Hawker to find a mechanic shop on the main road so I thought I’d try my luck and ask if they could help straighten these stabiliser legs for me. They offered to take a look and seemed impressed that I’d already removed them on my own. It was a big relief to have them fix them for me and they were kind enough to let me drive into their workshop (out of the rain and wind) to reattach the legs once they’d fixed them. While I was under the van doing up the screws to the stabiliser legs the ratchet spanner fell off in my haste and landed smack bang on my eyebrow bone – I swore as quietly as I could and could feel the instant lump on my head. I can now add black eye to my list of mishaps I think! For a little thing it can hurt a lot. 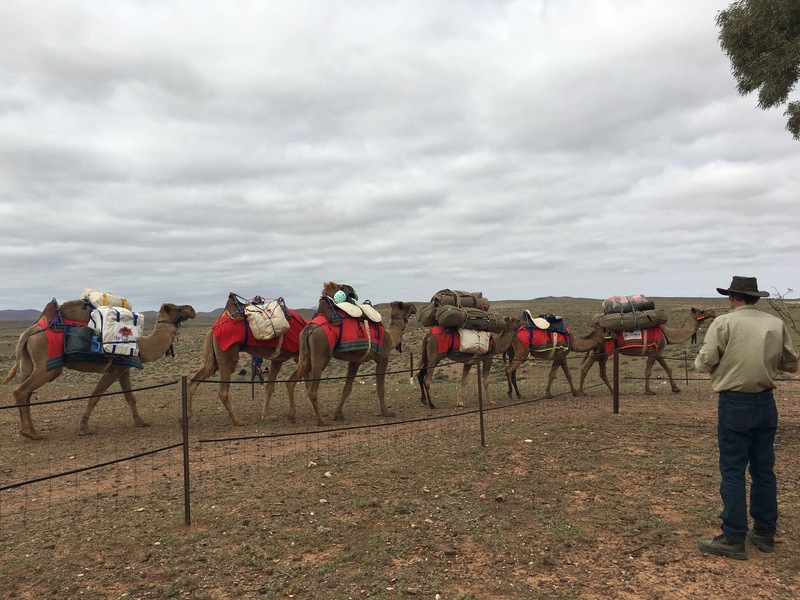 After spending a few hours in Hawker we abandoned the Port Augusta plans and headed north to Beltana, a sheep and cattle station with potential for a camel ride and the chance for Miss6 to feed animals. 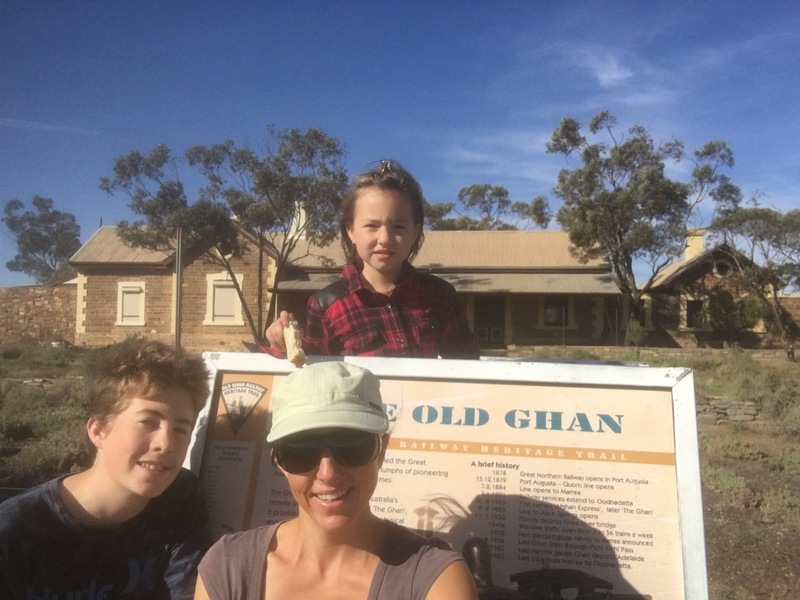 It would also buy us a few days to see if the Oodnadatta Track would open up to small 4WD while we were there. On the way out I had a little sob in the car – quiet enough so the kids wouldn’t hear as I’d done the night before in the camper after they’d gone to bed. It’s only a few little things that had gone wrong so far but sometimes these things get to you and it’s times like this I often think about how different it would be if I wasn’t doing all this on my own. The sobbing didn’t last long, after a few unrequited waves to passing caravanners, I got an enthusiastic wave back and that was enough to slap a big smile on my face. 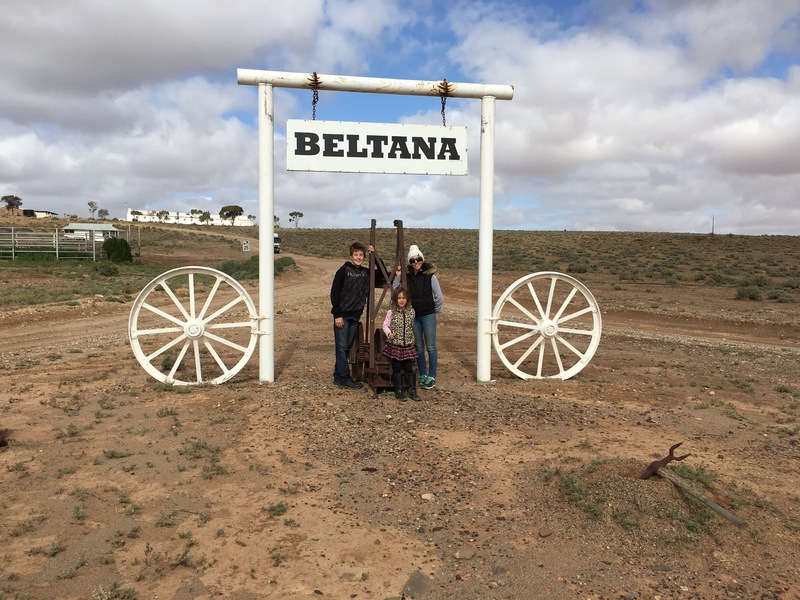 When we arrived at Beltana another family had not long arrived and they had a little girl – Miss6 was stoked! 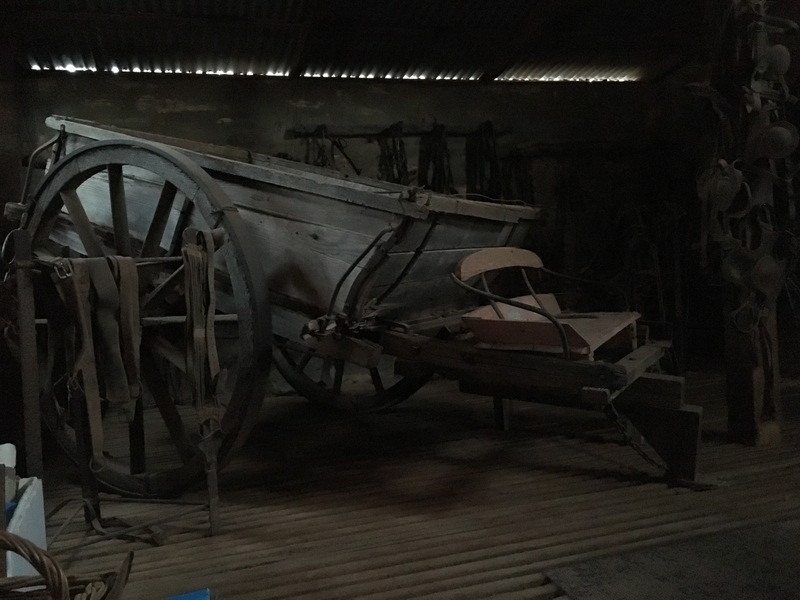 We enjoyed a home cooked roast in the Woolshed restaurant with some other travellers and workers on the farm and a great night sleep with no alarm the next morning. After we got up we went for a walk with the husband and three kids from this other family and it was so great to see the kids enjoying some new friends. I met Miss6 new BFF’s mum later in the day and for the few days we stayed at Beltana she was just what I needed – a down to earth real mum who understood those moments you love your kids but just want to leave them behind or remind them that they’re not the grown ups (Sometimes parenthood is a dictatorship not a democracy).Sharing stories and meals by the fire and watching the kids have fun with their new friends was enough to pep me up again for the next leg of our trip (that, and the fact that we had a successful touch down and take off with the stabiliser legs!). 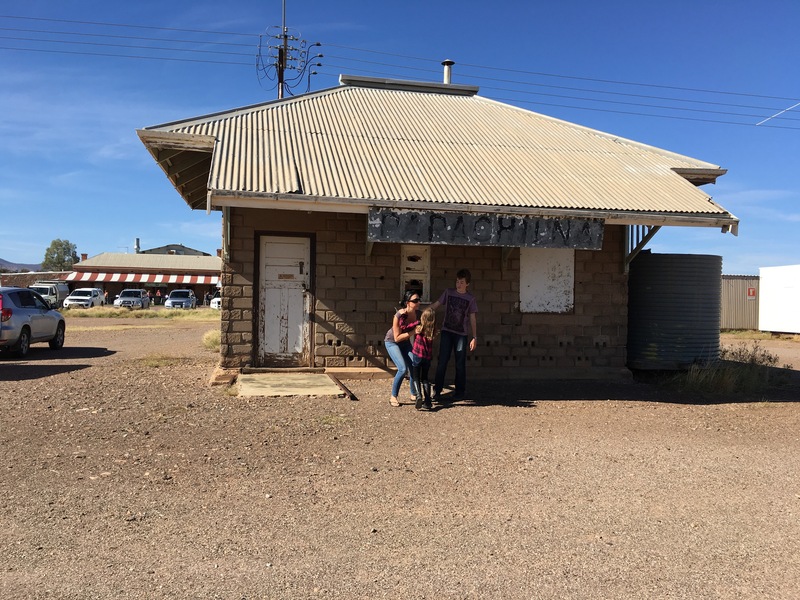 We’d hoped to follow our new friends across the Oodnadatta track but it remained closed to everything but heavy vehicles so we said farewell and headed south again to Port Augusta via the Prairie Hotel in Parachilna. 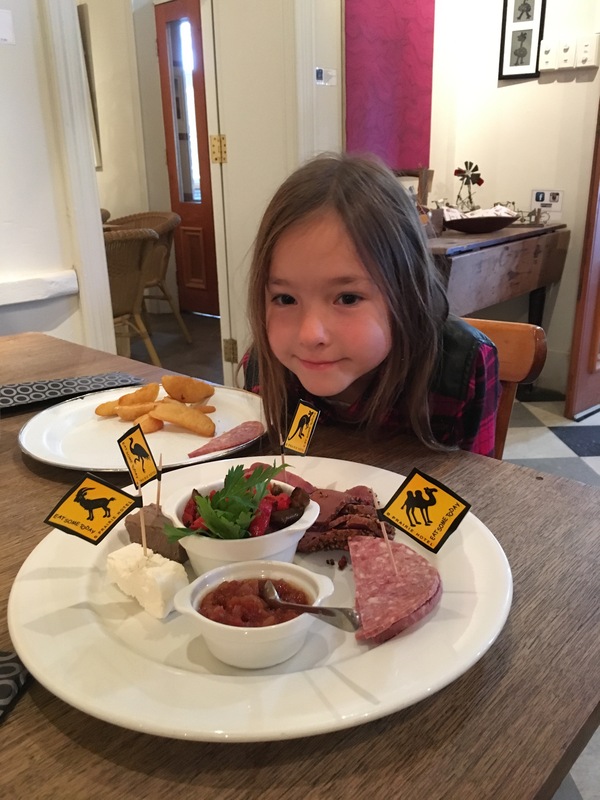 We stopped in at the hotel after our Beltana family friends had mentioned their feral antipasto platter (Emu, Kangaroo, Goat, Camel). Even our wannabe vegan tried everything on the platter (I told her they’d all died of old age or natural causes) and we thoroughly enjoyed our lunch. For the rest of the drive we had no radio (regular occurrence) so once again I listened to the Taylor Swift CD that workmates had packed for me. I find driving days are my time to think about a lot of the things I left behind – surprisingly, I’m appreciating some of Tay Tay’s words of wisdom and can even sing along to a few of her songs. Music and singing has always been my therapy – it’s another little thing but it means a lot. 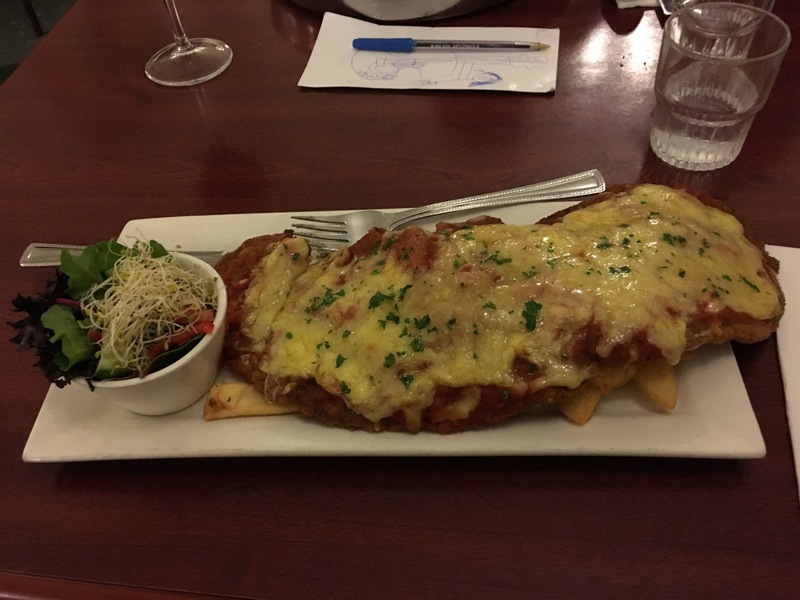 Port Augusta was about as I expected – though our dining out experience served up a pretty impressive parma to Master14 – it looked like it came off a camel it was that huge. Portugutta didn’t fail to disappoint though when, while packing up the next day to leave we realised that I had no lights to the trailer – again! Found an auto electrician who figured out the problem, fixed it up for me and even checked my other battery and lights on the van before we got out of there just in time before it meant a second night stay. 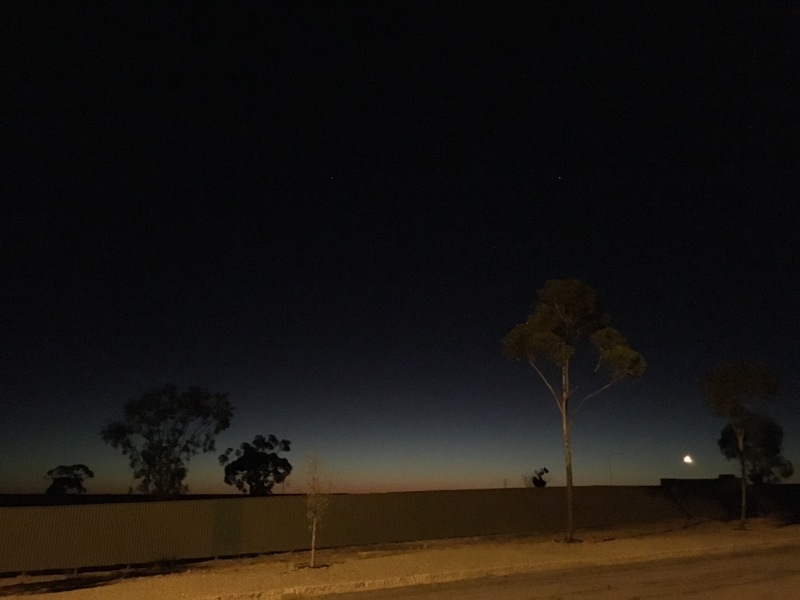 We’re heading to Coober Pedy next but stopped for one night along the way at Woomera. It’s a little caravan park with a little bar in an old shipping container but with a friendly barman and $4 Corona (even with a wedge of lime) I was pretty happy with this small town. 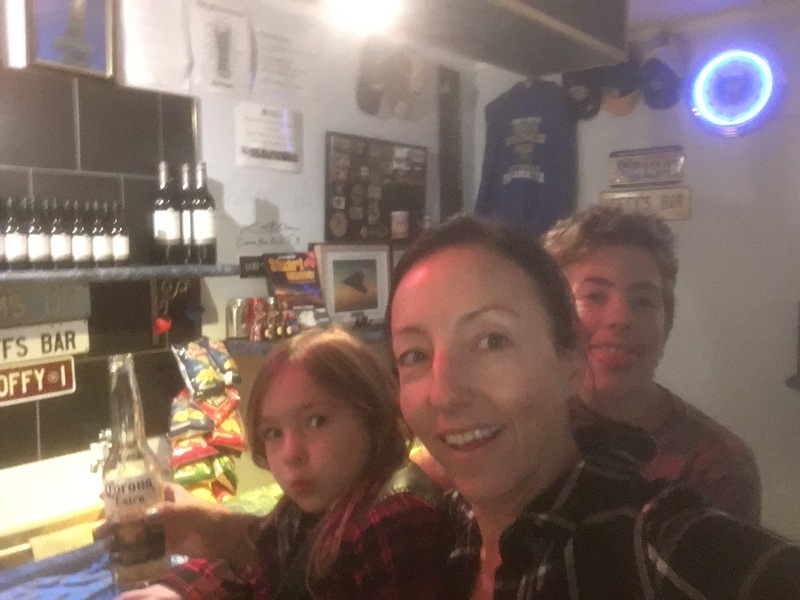 We even walked down to the footy club for dinner – three meals, another Corona and water for the kids $23 – got to be happy with that! The last few stops have reminded me that the little things can be the most significant – they can bring you down for a little while but it’s also the little things that make you realise what life’s all about and that it’s all worth while.